Since mid-summer, specialty jewelers have reported slowing sales; the industry reported a 4.5 percent sales decline in the fourth quarter of 2014. Worse, November-December 2014 holiday jewelry sales fell by 4.7 percent versus the same two-month period in 2013, as the graph below illustrates. The US jewelry industry lost market share in December compared to other retail categories: total retail sales (all merchandise categories) rose by 4.7 percent, driven largely by big-ticket auto sales, while total retail sales, excluding food and autos, rose by a respectable 2.7 percent. 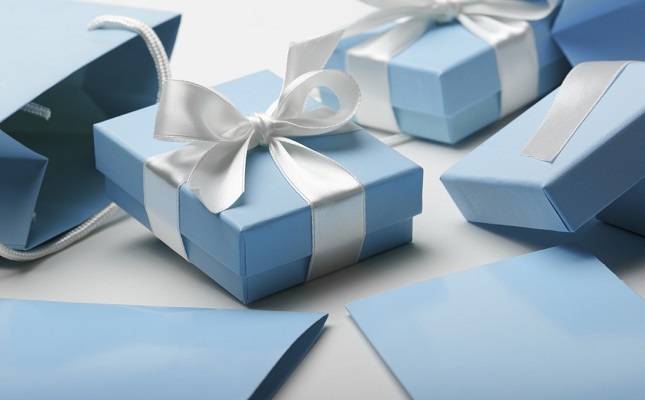 Clearly, consumers are willing to spend money on big-ticket items, but jewelry was not a beneficiary. In 2014, preliminary data shows specialty jewelers posted sales of $33.6 billion versus $33.2 billion in 2013. 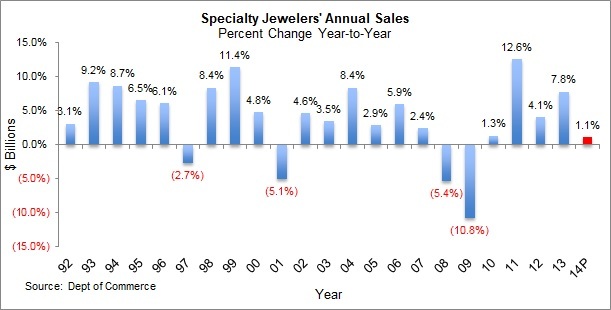 Specialty jewelers’ sales in 2014 edged ahead by only 1.1 percent, when compared to 2013 sales levels, as the graph below illustrates. Revised government data showed that jewelry demand in the US market during 2014 was weaker than previously reported. As a result, total jewelry sales in 2014 at all retailers selling jewelry, including multi-line merchants and specialty jewelers, rose by a very modest 1.5 percent, when compared to the prior year. Since specialty jewelers’ sales were ahead by only 1.1 percent, it is clear that these specialty merchants – especially independents – have lost market share to multi-line merchants like Wal-Mart, J.C. Penney and Costco. Specialty jewelers now have a 43-percent market share, down from nearly 73 percent in the early 1970s.